sure that he is able to repair or maintain himself his motorbike, if in doubt, leave it to professional mechanics. As I've not seen any threads about the twin's cam setup details - I presume everyone's happy with theirs, or, probably as it's such a pain in the backside job to sort out no one wants to approach it - I suspect the latter! I will describe a way to make the cam timing adjustable overall and adjustable between each cylinder. This is not really within the scope of all owners as access to workshop machinery is required. Along the way I'll mention a few observations and tips which you may find useful. Where realistic - I will also suggest areas that can be sorted with hand tools. The job can be done in two parts as you will see later. I'll drop in a bit of history about why I decided to do this, so if you only want the info - skip the next couple of paragraphs. For a long time I've enjoyed building performance Laverda motors - but know full well that to leave the cam timing wrongly set can waste a lot of hard work & expense. The triple is no problem, but the twins are a lot more difficult. My first effort - after finding a 6 discrepancy between the cylinders was to use a 3/16" (4.5mm) and 5mm piece of square steel, with one side milled to 4mm (the original key size) and the opposite side milled to 4mm, except for the portion that goes into 1 cam half - that was milled on the other side - even difficult to explain let alone do! After days of testing, with the cams and head removed several times, including a blunder where I put the offset key in the wrong way round and ended up with about twice the original problem! I got it almost right so bolted it all up. I was never happy doing this,- it was a bas---d of a job - also keep removing/replacing the cam flange wasn't doing it any favours either. About this time a few of us were proddy racing the twins in the Classic club - we started to run into serious problems with the crankshafts shearing the centre joining splines - I looked at loads of possible remedies, including using triple parts - I noticed that the cam chain drive sprocket on both cranks was the same dimensions. A light switched straight on in my head - The camshaft sprocket must then be the same dimension on both models, the twins duplex chain has the same specification as a triple's - just doubled up. I don't doubt that many others already realised this, but it was a gift for me. I soon checked it out - and, Bingo, I knew straight away the cam timing problem was as good as solved. As I've not done this job for about 10 years - I hope my recall is accurate enough. I know this may sound strange, but anyone who wants, and does start to do this job, will most likely have the skills and knowledge to be more than capable of finishing it. Firstly, obtain a couple of triple camwheels - most dealers will have an excess of these - especially used - and be delighted to "offload" some of them - don't get fleeced - phone round! On the twin's camwheel visually check the original timing mark's relationship with the keyway and position relating to the "hills & valleys" of the teeth. 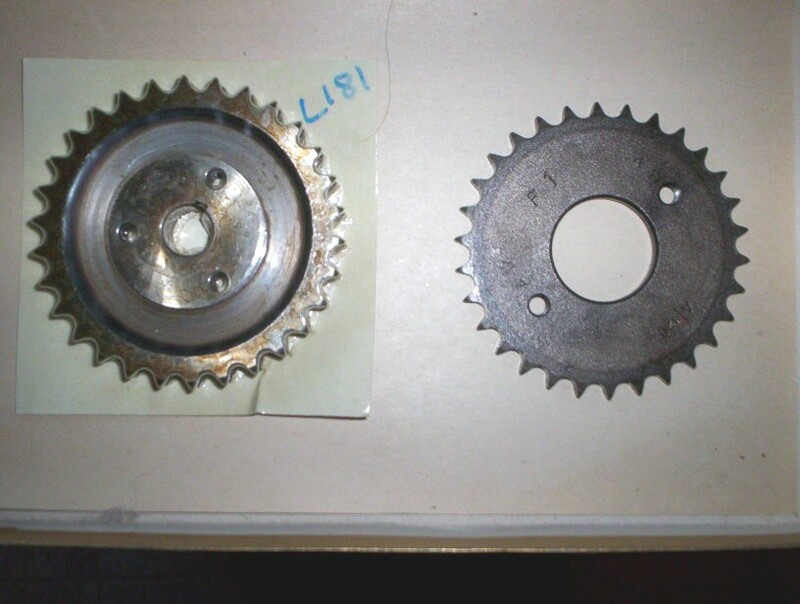 Measure the distance between the rows of teeth on the duplex sprocket, then grind them off where they are hardened - you could even use an angle grinder. Then mount wheel in a lathe and remove the rest of the lower, softer, area down to the original centre diameter at base of teeth. Skim the area between the mounting flange and outer evenly on both sides to give the same width as measured between the two rows of teeth. If you have to go a bit narrower to get area perfectly flat and blemish free, a bit of leeway is Ok, but the inner faces of the triple wheels can be relieved in that area if necessary. Bore out the triple camwheel's centres to be a snug fit over the twin's centre boss. Mount both wheels over the centre bosses, then align the teeth - the duplex chain can be looped round and secured to do this. Using a 6mm drill, carefully bore 3 holes spaced equally at 120? through the whole assembly. These holes are at a larger PCD than original tappings - you will see why when doing the job. Set up wheels to make sure you will miss the original tappings during this procedure. 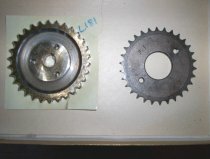 Separate wheels - Tap 3 holes to 7mm in one wheel and increase the other wheel's and the "new" centrepiece's (CP) holes to 7mm. Bolt whole assembly together with new 7mm bolts, then make a timing mark in the same place as original, using your previous record. Mount the CP on a rotary table and, with a 7mm slot drill or end mill, elongate the 3 holes to allow the teeth of new camwheel to move just over ¼ of a tooth. This job can be done, or completed, carefully with a file. The whole assembly is, unfortunately heavier than original - I have drilled lightening holes in mine, but still am a tad heavier. As cams run at half engine speed it is not so bad. I lap the new wheels to the CP with grinding compound - not sure if this is necessary - don't get any between centre boss and wheel. You now have the facility to adjust the overall cam timing. For this procedure the right hand cam (RH) is the dynamo drive side, the left hand (LH) is the primary drive side. This will enable timing to be adjusted between cylinders. This job can be done on its own, no need to do procedure 1 first. Obtain a length of 4mm keyway steel - a bearing shop or engineer's supplier will have this. Using a 4mm carbide or similar tipped end mill, elongate the woodruff key slot in each cam half to full length of flange. Elongate the 6mm mounting holes in the LH cam flange to allow just over ¼ of a tooth of movement either way - this will only be a couple of mm at this PCD. The holes can be elongated on a rotary table with a 6mm slot drill or end mill. Once again - they could be done, or finished, with a file. Cut and shape the 4mm keyway metal to finish up so that it does not protrude past the mounting end of flange I.E it does not enter camwheel. 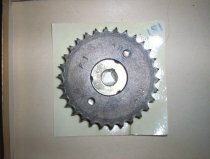 Fit flange to cam half. For the RH cam - cut & shape the keyway metal so that it protrudes into about halfway of the thickness of camwheel, but must not touch the LH cam half when bolted up. Fit flange to cam half. You may be wondering why I suggested elongating the RH half's slot, as it really is no different in operation than it was. - It is because I consider the original to be a weak point anyway. As the flanges are removed/replaced, each time they lose a tiny bit of their grip. If flanges are a loose fit on shaft, no extra pins, grub screws or whatever are likely to stop disaster happening. I would be among the first to point out that the key only locates an outer in normal circumstances, but there is, I believe, a design "blemish" here. I believe that, as the flange has quite a thin wall, the key, which is a good tight fit, actually embellishes (I've found another good word) the metal to metal contact in this application and benefits from being present along the whole length of flange. I do lap the flanges to camwheel before fitting to cams. Bolt the two halves and camwheel together and check that the movement is available. For this I am presuming both procedures have been done - for those only doing procedure 2 - the last bit will apply. Reassemble top end, with the cam flanges tightened to camheel, but the new camwheels only tight enough to allow CP to move independently - leave off top cover - make spacers to allow head to be pulled down. Mount dial gauge and timing disc and check RH cam - it can now be set to where timing is correct as CP can be moved a little whilst camwheels remain stationary then lock the bolt that is in view, then rotate crank to gain access to the other 2 and tighten them also. Check the LH cylinder's timing, and, if required, adjust timing to be the same as RH by loosening off the flange nuts and rotating RH assy independent of LH to get setting required. See my thread on triple camshaft timing - most of the checking procedure is similar to the twins. I've used this method on 3 of my motors - including my 90 motor - all have been raced - all have the stronger SFC type valve springs - none have given any problems.